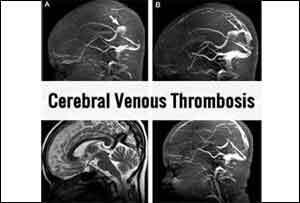 New guidelines for the diagnosis and treatment of cerebral venous thrombosis (CVT) have been issued by the European Stroke Organisation and updates the previous European Federation of Neurological Societies guidelines using a clearer and evidence-based methodology. The guidelines, published in the European Journal of Neurology, have also been endorsed by the European Academy of Neurology. Guidelines suggest using magnetic resonance or computed tomographic angiography for confirming the diagnosis of CVT and not routinely screening patients with CVT for thrombophilia or cancer. Guidelines recommend parenteral anticoagulation in acute CVT and decompressive surgery to prevent death due to brain herniation. Guidelines suggest preferentially using low-molecular-weight heparin in the acute phase and not direct oral anticoagulants. Guidelines suggest not using steroids and acetazolamide to reduce death or dependency. Guidelines suggest using antiepileptics in patients with an early seizure and supratentorial lesions to prevent further early seizures. The said guidelines could not make recommendations concerning duration of anticoagulation after the acute phase, thrombolysis and/or thrombectomy, therapeutic lumbar puncture, and prevention of remote seizures with antiepileptic drugs. In women who have suffered a previous CVT, contraceptives containing oestrogens should be avoided. Guidelines suggest that subsequent pregnancies are safe, but use of prophylactic low-molecular-weight heparin should be considered throughout pregnancy and puerperium.